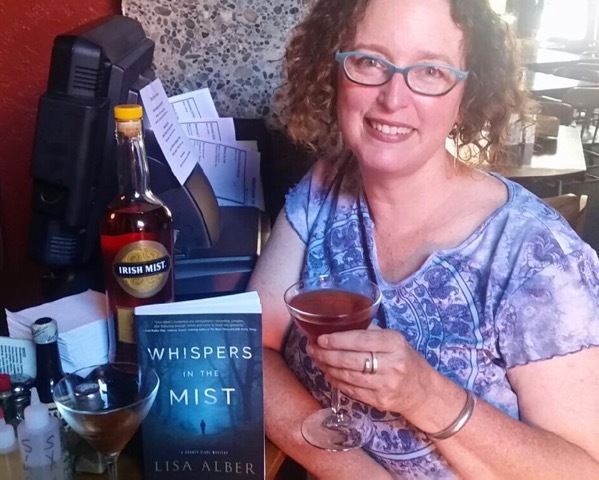 Lisa Alber is back with us again, matching her new book, Whispers in the Mist with a custom beverage in this week's edition of Drinks with Reads. 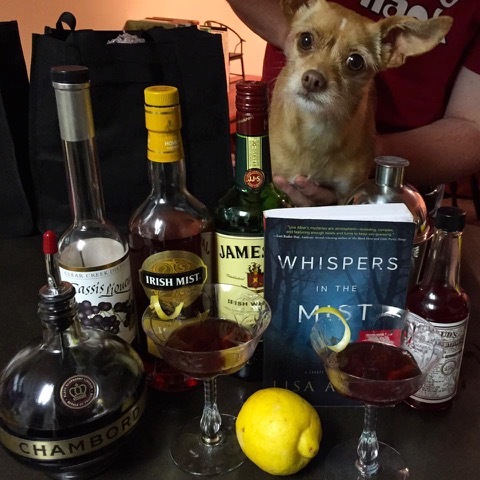 She takes us all the way to Lisfenora, Ireland for her novel, but if you're in Portland, OR tonight, you can get this signature cocktail at her book launch at O'Connors Vault, 7850 Capital Highway. Further details can be found on Lisa's website. If you go, have one for me. My debut novel, Kilmoon, set in Ireland, came out a few years back, and Deborah was kind enough to ask me to guest post about the signature cocktail inspired by the book. Its main ingredient was Irish whiskey, of course, and I called it the Kilmoon Sour. (You can read that post here.) At mystery conferences, I found myself enabling everyone I could persuade to consume it with me. I invited my friend Jim, a cocktail mixologist extraordinaire, to my house to engage in cocktail mixing. 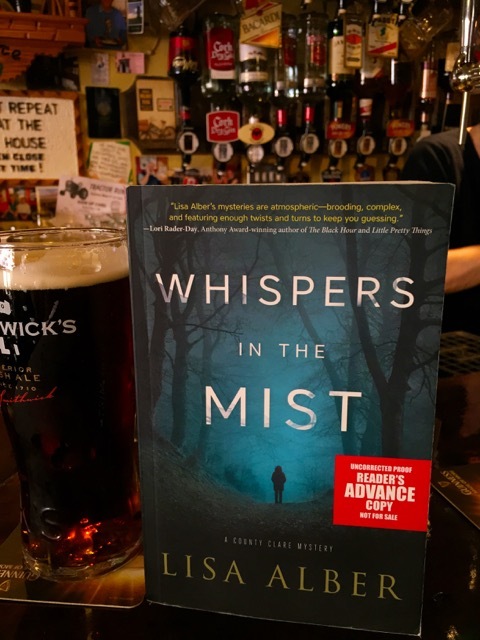 Irish whiskey would be the base again, plus in honor of the title “Whispers in the Mist,” the drink had to include—voilà!—Irish Mist (how perfect is that? ), a honey liquor that seems to be making a comeback according to the leathery-skinned lady at the state-run liquor store near my house. … And with the mists comes murder. All of this is to say that I feature a pub in many scenes, which is my way of circling the plot of my book back around to alcohol, the consumption of alcohol, drinking, and signature cocktails! Not that the crows would be caught dead drinking one of my cocktails, but, hey, I can still call my pub research forays during my Ireland trips inspiration, right? Put all the ingredients except the garnish in a cocktail shaker, over ice, and shake vigorously for at least a minute. Strain into a chilled martini glass. Garnish with lemon twist. Lisa Alber writes the County Clare mysteries series, which has been described as “atmospheric—brooding, complex, and featuring enough twists and turns to keep you guessing.” The debut KILMOON was nominated for Rosebud Award for best first novel. Visit Lisa at www.lisaalber.com. She blogs at Lisa Alber’s Words at Play. Also, visit her on Facebook and Twitter.